MadPea: It's a Mad, Mad, Mad City! It's a Mad, Mad, Mad City! So by now I'm sure everyone has heard that Mad City is going away at the end of this month. Crazy, right? We've all spent time there; often they were happy times as we partied at an event, shopped, played trivia, or just strolled the streets and enjoyed the ambiance. Other times it was in hot pursuit of a hunt clue or a puzzle piece. No matter what the reason, Mad City has been an amazing place for us and we are so sad to say goodbye. Of course we will be sending her out in typical MadPea fashion! 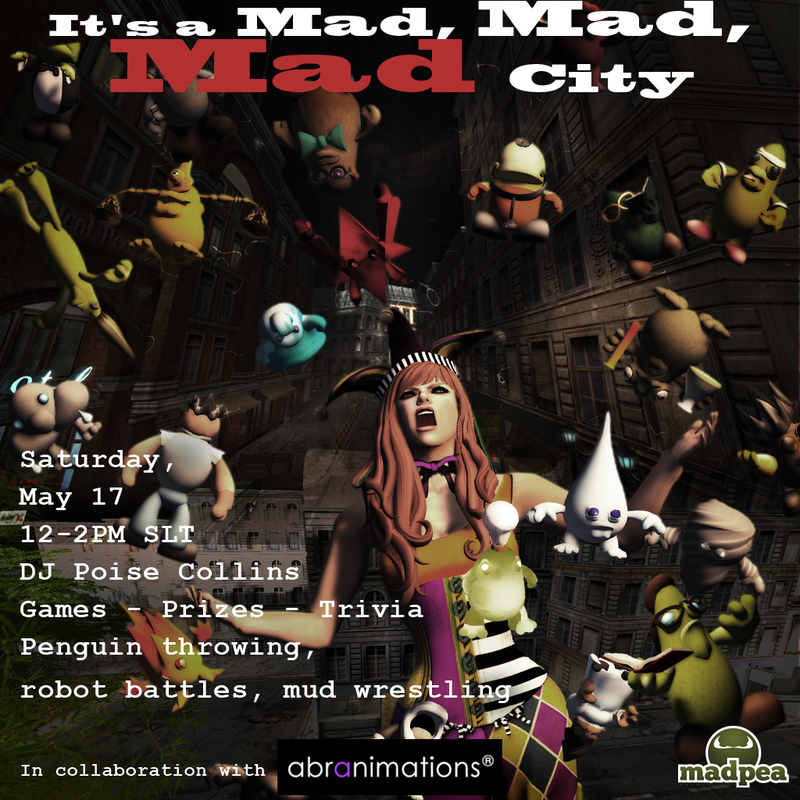 DJ Poise Collins will kick off the It's a Mad, Mad, Mad City party this Saturday, May 17, at 12pm SLT. She'll rock the park (Mad City Park, that is) for two hours. However, the other entertainment we have will be there for a few days. Abranimations so very graciously and generously donated a ton of awesome stuff for us to play with! Mad City Park is going to be set up with mousetraps, arm wrestling, basketball, bumper cars, robot battling, floor pianos, knife throwing, avatar cannons, mud wrestling, and penguin throwing. Because I care so much (definitely not just for my own amusement), I went ahead and tried out all of these. I had to know how they work, right? Refer to photos below! We will give away free prizes - costumes, fish slappers, hobby horses, and the super fun space hoppers. Queen Pea Kiana joined me in the wrestling pit. It may look like I was losing, but I won two out of three. Kiana suggested that we offer up Mud Wrestle a MadPea Staff Member. What do you think? Who do you trust to allow to throw knives at you? It turns out that I chose badly and ended up with a nasty side wound. That dress was totally ruined. No actual penguins were harmed in the testing of this penguin throwing game. So as you can see, there is the best time EVER to be had at the MadPea and Abranimations It's a Mad, Mad, Mad City party. Come dressed in your most funnest mad outfit, listen to some maddening music from DJ Poise Collins, play some games, win some prizes, and soak up the last bit of time we have left with our own beloved Mad City.